Host Jan Murray and guest Dorothy Claire in a comedy sketch on the August 2, 1952 episode of All Star Summer Revue. In 1952, instead of taking a break for the summer, All Star Revue continued. But this summer series had little relationship to the regular season show. Originating from New York's Center Theatre, there were no regular hosts, though Dave Garroway and Jan Murray repeated, as did a few of the guests. The budget was considerably lower, which explains why there were fewer big name guests. Sponsors were Pet Evaporated Milk, Kellogg's Cereals (Shredded Wheat and All-Bran), and the U.S. Army Reserve. Note: Dave Garroway was host of NBC's popular Today show, which had debuted the previous January. Magician Mr. Ballantine (aka Carl Ballantine) is perhaps best known as Gruber on McHale's Navy. "This mixture of lesser-known and recognized talent," reported Variety, "should not only be able to entertain, but do a service to the tele industry by proving that several newcomers can carry the bigtime." Note: It's clear from Variety's review that this program wasn't gelling: "The show has yet to make up it's mind whether it wants to be classified as a revue or a straight vaude show." 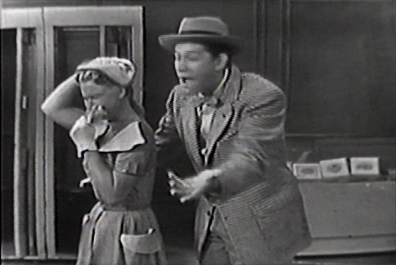 Note: Buster does a pantomime bit as a bill poster, and Rose Marie performs her "Butcher Boy" routine. Walter O'Keefe was an experienced radio emcee whose shows included Double or Nothing. Note: The stage hand known as "Charlie" appears to be actor John Fiedler. Note: Ella sings "Mr. Paganini" and "Ding Dong Boogie." According to Variety, noted humorist Goodman Ace wrote for this episode. It's not clear, though, who the host was. Note: Lew Parker replaced Don Ameche on The Bickersons radio show, but is best known to TV fans as Ann Marie's father on That Girl. The Bell Sisters sing "Bermuda" and "Blue Danube." Note: At the time, Sidney Armus and Jack Cassidy were appearing in the Broadway musical "Wish You Were Here." Sidney sings "Don Jose from Rockaway" and Jack does the show's title song. Jean sings "Lemonade" while Hoctor and Byrd dance, and Vic intones "God Bless America" as an introduction to the Medal of Honor winners.